French Realist painter Julien Dupré was born in 1851 to a family of jewelers. As a young man he first worked at a lace shop while preparing to enter his family’s business. Their jewelry shop was forced to close during the 1870 war and the siege in Paris. This forced the young Dupré to take art lessons in the evening at Ecole des Arts Décoratifs. This paved the way for his entry into the prestigious École des Beaux-Arts. The first teachers of Dupré at l’Ecole were Isidore Pils and Henri Lehmann. Around the middle of the 1870s he went to Picardy. There he became a student of Désiré François Laugée, an excellent landscape artist. Dupré learned to be a rural painter from him, and Laugée’s daughter, Eléonore Françoise, became Dupré’s wife in 1876. It was also the year when he had his first Paris Salon exhibit. Dupré became very famous as a Realist painter who showcased the colorful life of the peasants in Paris, deriving inspirations for his rustic and rural scenes from several areas in Brittany and Normandy. While there were many Realist painters, very few had the ability to paint animals, unlike Julien Dupré, Rosa Bonheur and Constant Troyon. These three artists were also associated with the Barbizon School. The painters from the Barbizon school were part of the art movement that transitioned from Romanticism to Realism. Active from 1830 up to 1870, there were several artists that gained prominence in this art genre, including Dupré, Jean-François Millet, Théodore Rousseau and Charles-François Daubigny. The paintings from the Barbizon School were very distinct for their color, tonal qualities, softness of form and loose brushwork. La Moisson en Picardie in 1876. Until the last years of his life, he would be submitting to the Salon paintings dealing with this scene. He received a third class medal in 1880 for his Fauchers de Luzerne and a second class medal the following year for La Recolte des foins. Dupré alone received the highest honor, a gold medal for his dedication to rustic life and field labor in the Paris Fair of 1889. The main subjects of Dupré’s painting are almost always larger because of the presence they manifested. It did not matter what the subject matter was, whether they were harvesters, milkmaids, girls with fowls, or women tending to their herd of animals. His style and manner of presenting the main subjects were reminiscent of the works of Jules Breton or Leon L’Hermitte, also Realist painters. Julien Dupré not only became known in France but in other countries as well, with several of his paintings finding their way into private and public collections in the United States. His paintings were distinctive for their freshness and vivacity, due to his spontaneous brushwork and his use of high key colors. His fine craftsmanship and masterful and fine handling of his subjects’ figures showed drama and elegance, a nod to his academic training. The freer handling of the backgrounds of his works, with the paints mostly applied with a palette knife, still showed Impressionist influences. Several of Dupré’s painting are in museums around the world. He has works displayed at the Metropolitan Museum of Art in New York. Some are in Boston, Missouri, Massachusetts, Nebraska, California, Florida, Maine and Kentucky. Dupré’s paintings were never posed. 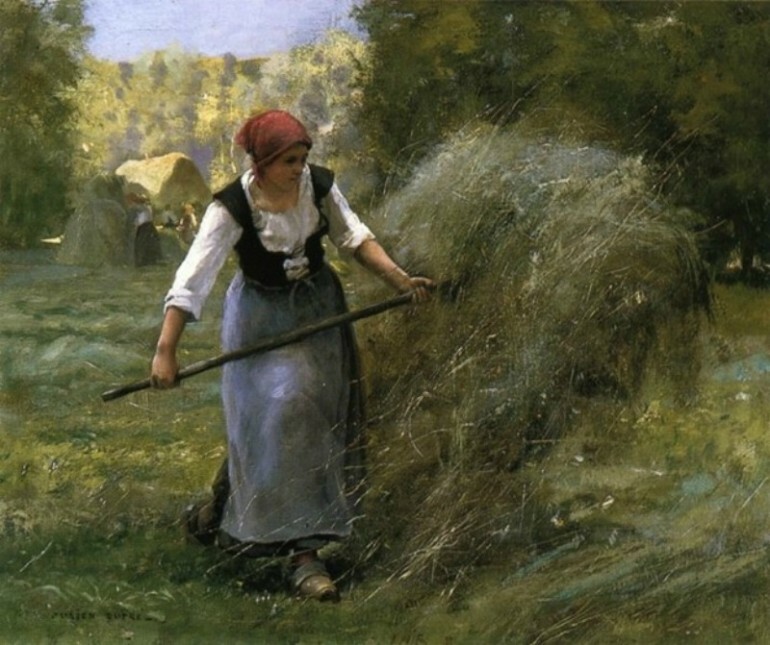 His painting were oftentimes engaged in actions, working at different chores in the farm, showing older women with bent backs due to hard work. His backgrounds were usually breathtaking landscapes although these never distracted from the main subjects. He employed natural light to great effect. His subjects may be animals and peasants hard at work, but their beauty and elegance come forth with such subtlety and grace. In his early submissions to the Salon, the critics looked as him as a close follower of Jules Breton. 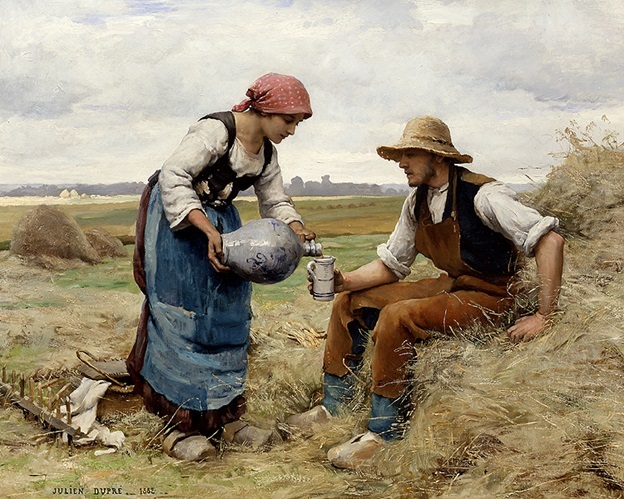 But Breton’s works were somber, compared to Dupré’s lighter, brighter, fresher and finer paintings, despite his subjects always being engaged in vigorous work. The most powerful and enduring example of his work was “The Haymaker” that showed a woman with almost Herculean strength turning hay with a pitchfork. One of his other very fine work was “The White Cow” that showed his skills in painting animals in great detail. Julien Dupré died on April 16, 1910 at the age of 59.